Samsung has announced a new tablet (Yes one more) namely the Galaxy Tab 2 which is the first tablet from the Korean giant running the latest Android 4.0 Ice Cream Sandwich out-of-the-box. Going by the look and design, the new tablet is almost similar to that of the original Galaxy Tab and there is nothing much new in it. On the specs front, the Tab 2 features a 7-inch WSVGA display (1024×600) PLS TFT LCD, is powered by a 1GHz dual-core processor supported by a 1GB RAM. Has a 3MP fixed focus camera at the back and a VGA camera at the front. Has HSPA+ support, Wi-Fi, Bluetooth 3.0, A-GPS, will come with an option of 8, 16 or 32GB internal memory with support of a microSD card slot and will run on a 4,000mAh battery. The Tab 2 is slightly thicker than the original Tab and is 10.5mm thin tablet and misses a LED flash at the rear. It is loaded with services like TouchWiz UI with Live Panel, Samsung Apps support, Hub support, a real-time app recommendation engine called S Suggest, Kies Air, ChatON, Allshare Play and more. 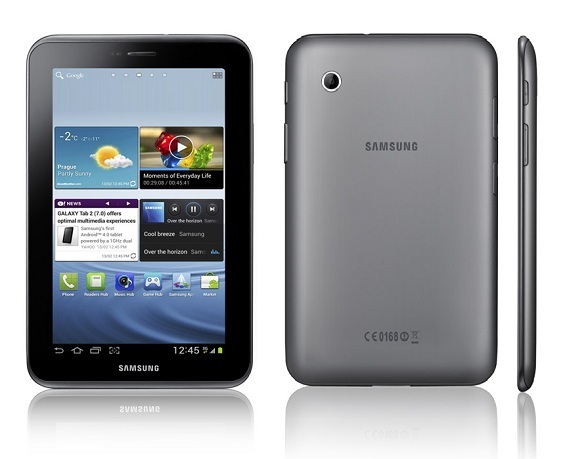 The Tab 2 will first launch in the UK as confirmed by Samsung and will be available as soon as by March 2012. The Tab 2 will be available in both Wi-Fi only and Wi-Fi plus 3G variants. And is being priced at around 349EUR (463 USD) for Wi-Fi only version and 429EUR (568USD) for the 3G version.